I wanted to share an experiment that I worked on with Mark Algee-Hewitt to reconstruct the table of contents of our new collaboratively authored book, Interacting with Print. The book was written by 22 co-authors around the theme of interactivity. Mark and I thought it would be great to do a digital intervention into the print convention of the TOC. Below you can see two network graphs of relationships between chapters. The first is a network of links between the “renvois” inside of chapters. 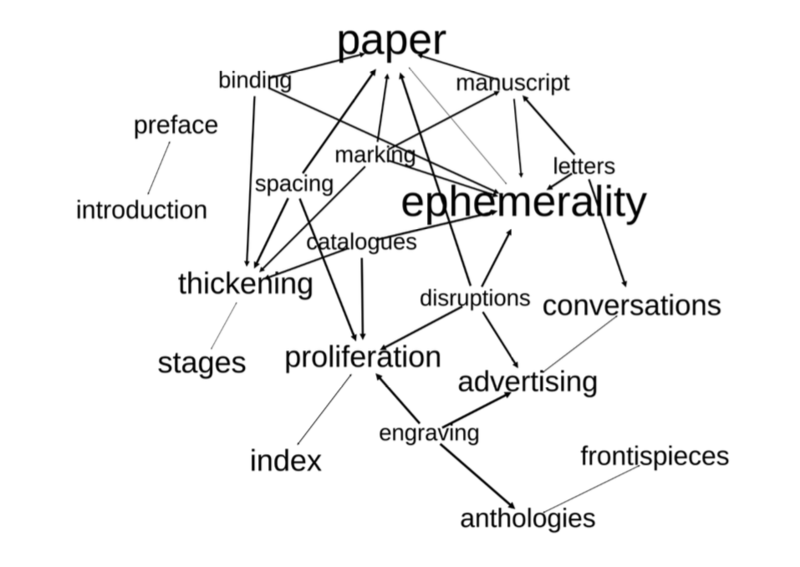 We used a system of cross-references to point to other chapters within the book that dealt with related themes [Paper] as in the French Encyclopédie. 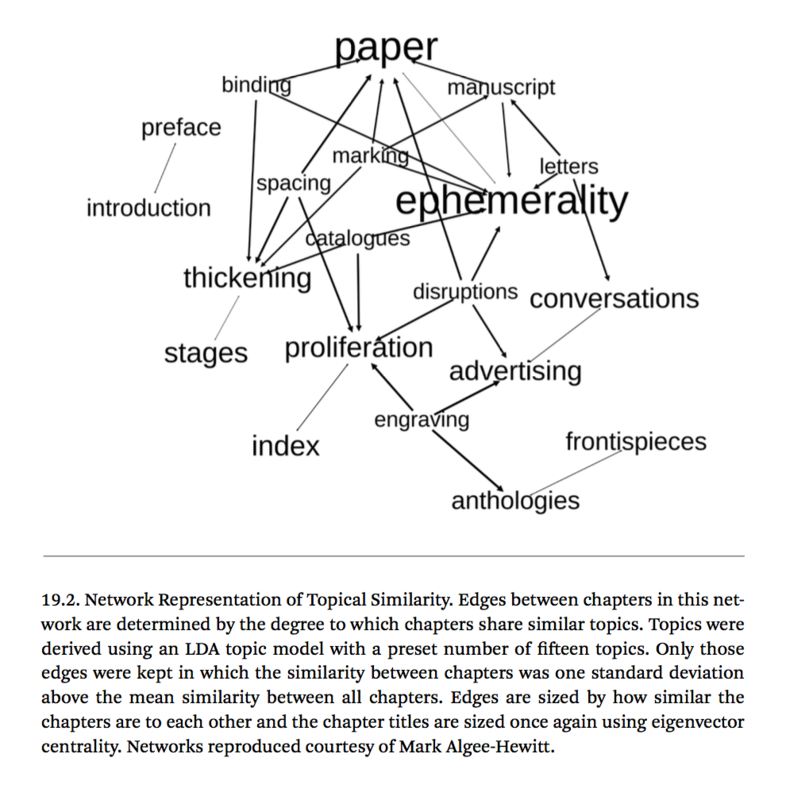 The second shows relationships based on the use of topic-modeling each of the chapters and drawing connections based on the presence of shared topics. The first represents authors’ explicit beliefs about which chapters are most related, while the second represents latent connections derived through shared language. In each case, we move past the linear table towards the more reticular network. These networks tell us different things about the relationships within our book. 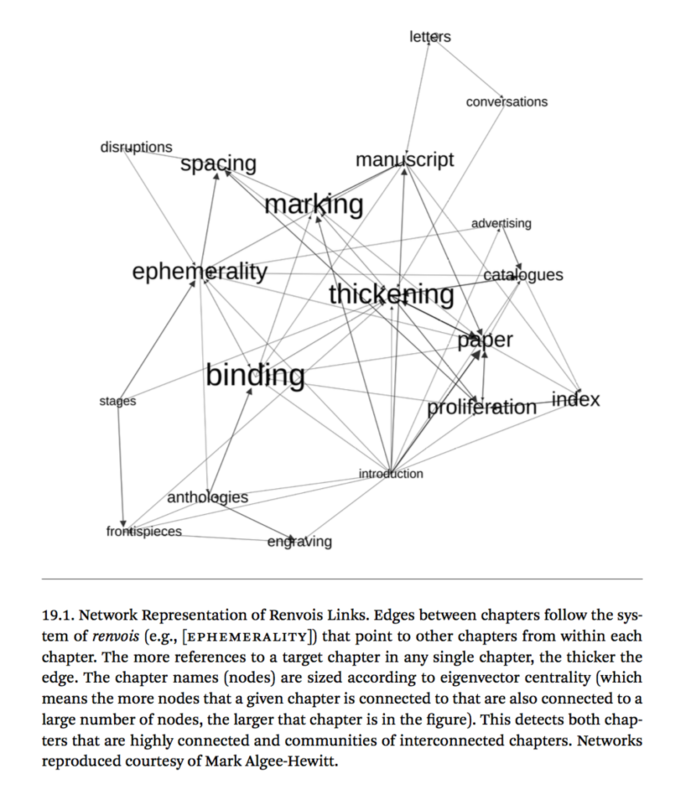 The renvoi network shows that binding, a chapter about constructing books, is the most centrally connected, followed by thickening, which is about adding pages to books. One can see how visual chapters like Frontispieces, Engraving, and Stages mark out one pole while non print spaces mark out another. You can also follow the directionality and move from letters to manuscripts, or from advertising to catalogs, or spacing to disruption to ephemerality in a suggestive causal sequence. Where the first network privileges gerunds, the network of latent topics is more centrally organized around qualities like Paper and Ephemerality. That these are the two most linguistically central chapters suggests an interesting medial centre point of our history (paper), as well as an interesting new temporal framework that has been far less central to print studies in the past. Print has most often been associated with notions of permanence and reproducibility. Focusing on interacting with print seems to move that focus more towards the fleeting and contingent aspects of print media. This is obviously just a beginning in experimenting with ways that computational methods can interact with print conventions and change the way we organize and structure information. Surprisingly, we still remain in a very print-centric universe when it comes to sharing and archiving information. We hope experiments like this one will nudge us towards trying out more alternatives.